Pannukakku (Finnish pancake), Ham, Nordic Sausage, Breakfast Potatoes, Fresh Fruit, Scandinavian Cheese Selection, Fresh Pastry, Breads and Crisps, Water/OJ/Coffee. $10.00 per person. Visit the midsummer vendors to find specialty Scandinavian items and handcrafted treasures. Many booths offer Scandinavian food items for your dining and snacking pleasure. Be sure to buy raffle tickets for the $1,000 cash prize and many other fine prizes donated by the Astoria Scandinavian Midsummer Festival Association and festival vendors. Jackie and Larry Taylor of Yelm, Washington will show their Icelandic horses in the horse arena next to the Midsummer Pole. Icelandic horses are a pure breed that developed in Iceland. The horses are mostly pony-sized but are still called horses. Jackie and Larry will provide demonstrations of these attractive animals and let you see them up close. There will be live Scandinavian themed entertainment throughout most of the day. Pick up a festival program at the admission table or view one of the posted schedule to find your favorite band, singer, or dance troupe. 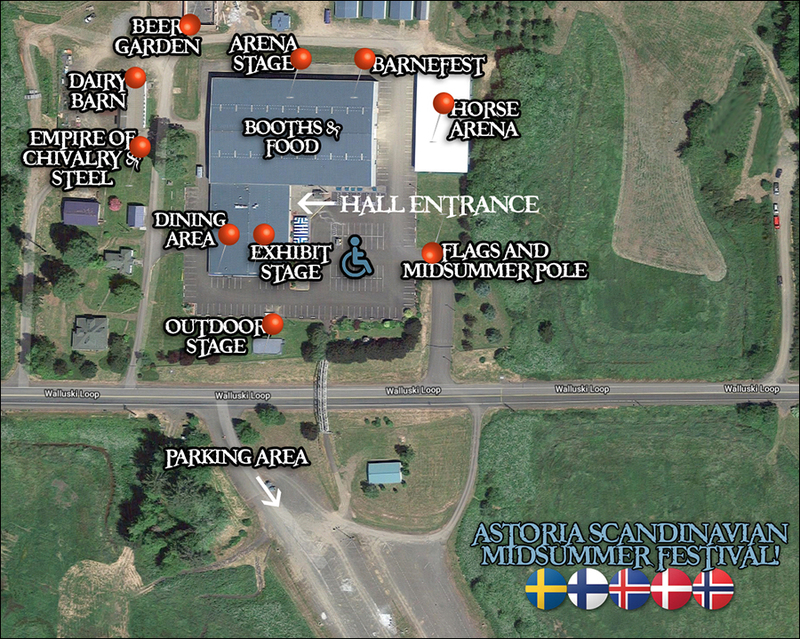 The Empire of Chivalry and Steel will hold an open house in their Viking encampment outdoors south of the Arena. Costumed reenactors will demonstrate crafts, tournaments, armor making, and combat arts from the culture of the Middle Ages. Young festival attendees can participate in children’s activities in the Barnefest area. This area is staffed by volunteers from Tongue Point Job Corps Center, the Nordic Viking Dancers, and by parents. Children under 12 need to be accompanied by an adult. Join us for a non-denominational church service. Pastor and special music will be announced later. Scandinavian lodges have submitted a list of words they think everyone should know. There will be a brief pencil and paper quiz to determine semi-finalists who will stand up and face the quizzes for an oral spell down. Prizes will be awarded. How many Æbleskiver (Danish donuts) can you eat in five minutes with your hands behind your back? The champion will win an Æbleskiver’s pan and recipe. Participants must be in good health and sign a waiver. 18 or older. Who will win the great prizes donated by community members and businesses to support the children’s activity area? Who will win the raffle grand prize of $1,000 and the other beautiful prizes donated by the Scandinavian Festival Association and lodges and businesses? Did you buy your tickets? Join us on Sunday to learn who the winners are. You need not be present to win. The 2019 Scandinavian Midsummer Festival ends as the national songs of Denmark, Finland, Iceland, Norway and Sweden are sung one more time and the flags leave the hall. Say good-bye to your friends and family and make plans to join us again in 2020 for our 53nd anniversary festival. See you again on June 19, 20, 21, 2020! Friday, the festival kicks off with vendors, food and live entertainment. Friday’s major evening events include Queen's Coronation, a Bonfire with Hex burning, and a public dance. Learn more about all of the fun Friday events! Saturday continues with the Midnight Sun Breakfast, Troll Run/Walk, OpTog parade, Midsummer Pole, Beer Garden, Viking Encampment, folk dress parade, children’s games, public dance, & more. Learn more about all of the fun Saturday events!